Our final look at the booths of Comic-Con 2012 ends with Gentle Giant. Gentle Giant will be doing busts of many of the characters appearing in The Hobbit: An Unexpected Journey. Until Comic-Con we had not had a chance to see just what Gentle Giant would have in store for fans. Their booth did not disappoint. 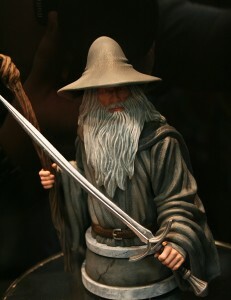 The four characters making an appearance at Comic-Con were: Thorin (Comic-Con 2012 Exclusive), Gandalf The Grey, Gollum, and Dwalin (2012 PGM member exclusive). All four of these busts looked great and I think their quality means fans will be jumping all over this line. Plus the ballpark figure for this range of collectibles will run $70.